There Is No Justice in the Capitalist Courts! On July 22, the judges of the federal Third Circuit Court of Appeals issued a two-sentence ruling, refusing to hear a petition filed by Mumia’s attorneys less than a month earlier, on June 27. That petition, which was based on the racist jury-rigging at Mumia’s 1982 trial, asked for the full court to review the March 27 decision by a three-judge panel of the court that affirmed Mumia’s frame-up conviction and condemned this fighter for black freedom to either life imprisonment or a new sentencing hearing that could reinstate the death sentence (see “Free Mumia Abu-Jamal Now! New Legal Papers Filed,” WV No. 917, 4 July). The three-judge panel’s decision had upheld a December 2001 ruling by federal District Court judge William Yohn, who overturned Mumia’s death sentence while upholding his frame-up conviction. Robert Bryan, Mumia’s lead counsel, announced he will be filing a petition for review to the United States Supreme Court, the last legal avenue available to Mumia. The Philadelphia District Attorney’s office, which had previously announced that it would be seeking to reinstate the death sentence, recently stated that it is undecided. A Black Panther Party spokesman in his youth, then an award-winning journalist known as the “voice of the voiceless” and a supporter of the Philadelphia MOVE organization, Mumia was framed up for the 1981 killing of Philadelphia police officer Daniel Faulkner and sentenced to death explicitly for his political views. For 26 years, the cops, prosecutors, bourgeois politicians and their media jackals have howled for Mumia’s blood because they see in Mumia a voice of defiant opposition to all forms of racist discrimination, the spectre of black revolt. That the courts would again deny justice to America’s foremost class-war prisoner was clear to anyone who wished to see. Court after court has refused to consider the mountain of evidence of Mumia’s innocence, including the confession of Arnold Beverly that he, not Mumia, shot and killed Officer Faulkner. Those same courts have repeatedly discarded their own precedents and rules in favor of special “Mumia rules” to keep this “voice of the voiceless” in prison hell. Making a mockery of the Supreme Court’s 1986 Batson decision, which prohibits the exclusion of jurors based on race, the March 27 Third Circuit decision dismissed the overwhelming proof of racist jury-rigging that marked Mumia’s 1982 trial, where the prosecution used eleven of its 15 peremptory challenges to get rid of black jurors. Enunciating a new rule—adopted from the prosecution’s arguments—the Third Circuit decision held that Mumia’s claim must be rejected because he and his attorneys failed to provide evidence of the racial composition of the entire pool of prospective jurors for the trial. Philadelphia journalist Linn Washington captured the Kafkaesque quality of the court’s decision: “That initial rejection, for example, faulted Abu-Jamal’s 1982 trial attorney for not following legal standards that the US Supreme Court did not create until 1986—four full years after that trial. That rejection faulted Abu-Jamal’s 1995 lawyers for not presenting certain evidence of jury selection discrimination that the ’95 hearing judge blocked lawyers from presenting even to the point of briefly jailing one lawyer for objecting to this judge’s obstruction” (CounterPunch, 26/27 July). Indeed, Judge Albert Sabo quashed a subpoena for the Philadelphia County Commissioner of Jurors and dismissed a motion for discovery of the name, address and race of each member of the jury pool for Mumia’s 1982 trial. The lawyer who was jailed was Partisan Defense Committee counsel Rachel Wolkenstein, a member of Mumia’s legal team from 1995 to 1999. Along with Jonathan Piper, another attorney associated with the PDC, Wolkenstein resigned when then-lead counsel Leonard Weinglass suppressed Beverly’s confession. Since the Partisan Defense Committee—a class-struggle, non-sectarian legal and social defense organization associated with the Spartacist League—and the SL took up Mumia’s case in 1987, we have advocated pursuing all possible legal proceedings. At the same time, we have always fought against any illusions in the courts of the capitalist class enemy. We have insisted that the courts could be made to respond only out of fear that executing or imprisoning Mumia for life would exact too high a cost in social and class struggle. The power that can make the courts yield is the power of the multiracial working class, which must be mobilized independently of and in opposition to the capitalist state and its political representatives, whether Democrat, Republican or Green. This program of class-struggle defense is diametrically opposed to that of the liberals and reformists, who promote dangerous illusions that the courts can provide justice for Mumia. These illusions are codified in the subordination of the demand for Mumia’s freedom to the call for a “new trial.” This has been promoted for many years by the Workers World Party (WWP), International Socialist Organization, Socialist Action (SA), the International Concerned Family and Friends of Mumia Abu-Jamal (ICFFMAJ) led by Pam Africa and the San Francisco Mobilization to Free Mumia Abu-Jamal led by SA honcho Jeff Mackler, and has played a key part in the demobilization of what was once a mass movement. Why mobilize on the streets or in the unions if Mumia can get justice from the courts? Immediately after the March 27 Third Circuit Court decision, the PDC and its fraternal defense organizations internationally held emergency protests. The PDC also called for international united-front protests under the slogans: “Mumia Abu-Jamal Is Innocent! Free Mumia Now! Abolish the Racist Death Penalty!” Protests were held in April in Oakland, London, Toronto, Sydney, Chicago, Los Angeles and Mexico City. These protests brought together individuals and organizations representing diverse political viewpoints—trade unionists, anti-racists, death penalty abolitionists, gay rights activists, leftists and others—united behind the struggle to free Mumia. Central to the united-front protests was the understanding that the fight for Mumia’s freedom must be based on the fact that he is innocent—the victim of a racist political frame-up. The PDC and its international fraternal defense organizations also organized Class-Struggle Contingents in a number of protests called by other groups. The contingents expressed our understanding that the working class must be mobilized to fight to free Mumia and with no illusions in the “justice” of the capitalist courts. In addition to the united-front slogans, the contingents also marched under the slogans: “There Is No Justice in the Capitalist Courts! Mobilize Labor’s Power—For Mass Protest!” (see “Protests Demand: Free Mumia Now!” WV No. 914, 9 May). Our fight to free Mumia is part of our struggle against black oppression, which is rooted in American capitalism. The brutal state repression directed against black militants is intended to terrorize not only fighters for black rights but all those who would struggle against capitalist exploitation and oppression. The segregation, discrimination, unemployment and corresponding mass imprisonment of black youth form a wedge to keep the working class divided. The struggle against racist oppression and in defense of class-war prisoners like Mumia is part of the struggle for the unity of the multiracial working class against its capitalist class enemy. Time is short. Mumia has nearly reached the end of the legal road, and there is no reason to believe he can receive a better outcome before the neo-segregationist U.S. Supreme Court. The fight to free Mumia embodies the struggle against this system of capitalist exploitation and racist oppression. This underlines the urgent need to mobilize the social power of labor in his defense. Mumia Abu-Jamal is innocent! Free Mumia now! Abolish the racist death penalty! 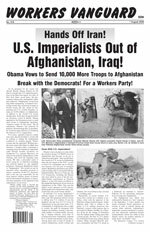 U.S. Imperialists Out of Afghanistan, Iraq! For a Class-Struggle Workers Party! UCLA: 16 Arrested at SDS/SWF ProtestDrop the Charges! For Free, Quality, Integrated Education for All! Down With Racist Fee Hikes! Abolish the Monarchy, the House of Lords and the Established Churches!